As some of you know, our 23-month old granddaughter Emma has been living with us for some time, along with her mom Anne, of course. They live right next door, but mostly take meals with us and hang out over here. Now Emma is a powerhouse, probably all kids her age are. She can easily wear out her mom, Margaret and I, plus the two dogs. Easily. Every morning when I hear our side door open, as often as not I hear the word "Grandpa! as Emma hits the floor running for my office. Since it is getting winter-like, the first order of business (after a big "Hi!") is for me to help her take off her hat and coat. That makes sense, but then Emma wants to get rid of her shoes and socks and anything else she can. I try to block that because the floor is kind of cold. Next Emma wants me to play on my computer screen any of a growing list of music videos she likes, and she usually specifies exactly which one by name. Emma is now talking in full sentences. These are, for the most part, songs from various concerts by her aunt May. After all, Emma's middle name is May. All that is well and good, but by now Emma has figured out all of the little thumbnails running down the right-hand side of the screen are also songs by May and she has taken to pointing to one of these (which one is hard for me to tell), and demanding we play that one. Well, I tried that once or twice, but she soon had me switching songs after only ten seconds or so, and I had to put my foot down. One song at a time. Meanwhile I am trying to work, but Emma likes to put her left arm on my keyboard area and shove me to the left. I try to oblige. There she is, standing on the floor with her little arms and elbows flattened out on my desktop staring at the screen. This goes on for a while and then Emma suddenly has had enough and wanders out of my office and toward the kitchen, probably to see how breakfast is coming. However, if I turn off the music, she can hear that and comes running back to make sure I turn it on, even though she is as she says, "All done!" One of the things Emma loves most is to have popcorn and watch a movie on the couch in my office. Now Emma is not yet allowed to watch just any movie. We tried that and when something disturbing comes up, like bad guys, etc., Emma turns, looks me right in the eye with a trouble look, yells "Mama!" and runs out of the office. So now, we watch these vacuous videos, like "Baby Einstein" (even Emma gets bored from them) and eat popcorn together, surrounded by two impatient dogs hoping for a dropped kernel to hit the floor. And there we sit. 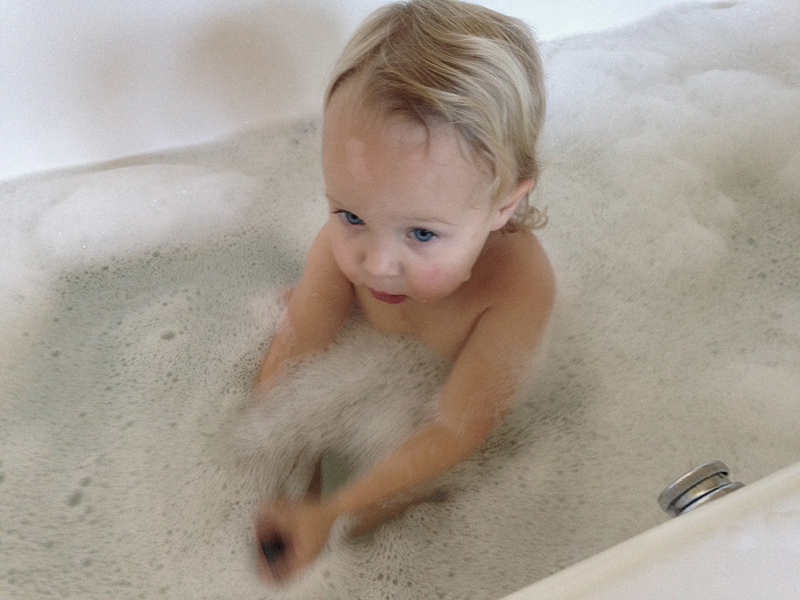 Anyway, here is Emma at one of her first bubble baths (something she now loves) which were started recently by Grandma. And Grandma deserves the "Most Valuable Player" award (aside from Emma's mom), for taking care of Emma for long stretches each day. God bless her! It gives Emma's mom a chance to catch up and get things done.